Okay, we’re going to file this under beyond ridiculous. In fact, this may be the first in a series of just unbelievable reports pulled from the NRC files that we’re going to blog about. Today’s report comes from NRC Report number 834291. This is a report that was received at the National Response Center back on May 3, 2007. The caller is reporting that during an overflight, a spill from a downed platform from Hurricane Katrina was discovered. 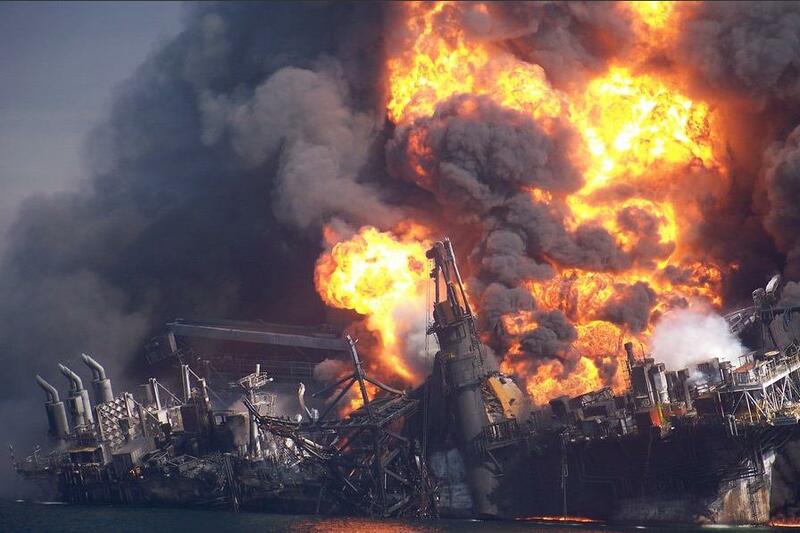 The spill was found just off Grand Isle, LA and the responsible party is listed as BP America. The released material is said to be crude oil. The amount of crude oil released into the water? Are you ready for it? ONE DROP. Yes, apparently, with bionic eyes from his aircraft, the caller was able to see that ONE DROP of crude oil was spilled from a downed platform. This ONE DROP of crude oil created a sheen that was reported to be 80 feet long by 2 feet wide. Let’s compare that report against one that was called in on August 17, 2004. That report was also called in listing BP as the responsible party. The August 17 report, number 732083, states that a loose plug on a drain deck caused a release of material on a platform. The material spilled into the Gulf of Mexico from this spill was hydraulic oil. The amount spilled during THAT incident was TEN DROPS. Did they count them as they went in? And the size of the spill from those ten drops of hydraulic oil? 10 feet long by 10 feet wide. Was that one drop of crude oil a magic drop? Was it a drop the size of a cow? How do you have one drop of oil create an 80 foot sheen, yet a spill of 10 drops only causes a 10 foot sheen? Inconsistent reporting? Party of one? Your table is ready. Stay tuned, there are plenty of inconsistencies, and we’re more than happy to bring ’em to your attention in the days and weeks to come. Coal Mining – Our Featured Gallery This Week. To see the full size images and many more beautiful images like these, go check out our Flickr galleries and don’t forget to visit our Facebook page and tell us what you think! https://skytruth.org/wp-content/uploads/2011/04/4322736136_b44519f643_m.jpg 147 240 Teri Biebel /wp-content/uploads/2016/08/test_logo.png Teri Biebel2011-04-26 14:04:002019-02-26 09:47:07Coal Mining - Our Featured Gallery This Week. The weekend of April 15-17, John was invited down to Mobile, Alabama for the SouthWings Fly-In, a conference attended by many of the volunteer pilots who are affiliated with one of SkyTruth’s Gulf Monitoring Consortium partners. John gave a presentation on Saturday, and then Sunday, had the privilege of going out into the Mobile-Tensaw Delta on a swamp tour with world-renowned naturalist E.O. Wilson hosted by another Gulf Monitoring Consortium member, the Mobile Baykeeper. John was very excited at the opportunity to go out and get his feet muddy (in loaned boots – thanks Ben!) alongside someone he’s admired and respected for many years. And to see alligators, dolphins, snakes and turtles. Did we mention alligators? BP / Deepwater Horizon Oil & Gas Disaster – What’s Changed? 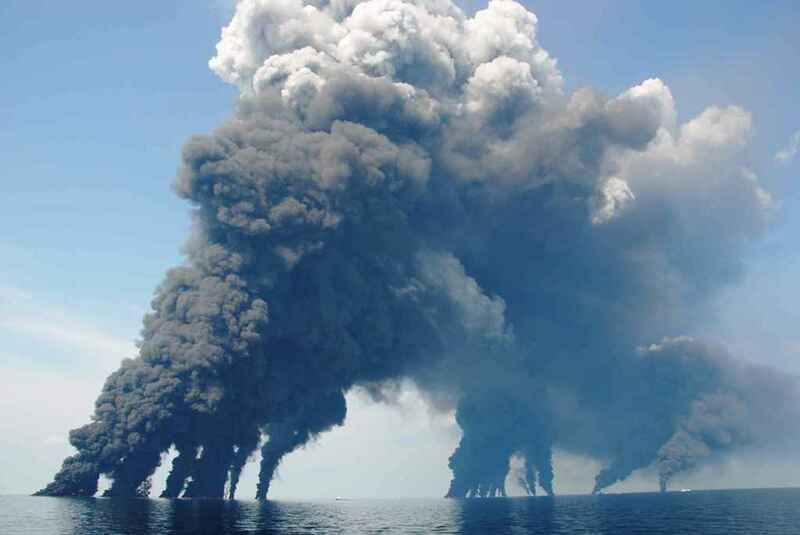 The Deepwater Horizon’s final hours, April 22, 2010. Photo courtesy New York Times. More here. One year ago today, after an explosion and fire that killed 11 workers and injured 17 others, a technological marvel — the Deepwater Horizon semisubmersible drill rig — slipped beneath the waves and sank in 5,000′ of water, 40 miles offshore in the deep Gulf of Mexico. The rig had drifted and burned out of control for nearly two days following the catastrophic blowout of BP’s ill-fated oil and gas well, named Macondo, that triggered the blast at 10pm on April 20. We didn’t know it at the time, but this was the start of what would become the world’s worst accidental oil spill. 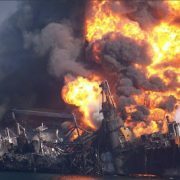 Before the well was finally brought under control and capped on July 15, it had gushed 172 million gallons of crude oil, and billions of cubic feet of natural gas, into the cold, dark waters at the bottom of the sea. The Gulf’s resiliency has proven some of the gloomiest of doom-sayers wrong; this is a naturally “oily” ecosystem, with hundreds of known natural oil and gas seeps in deep water, and a microbial defense system that reminds me of the white blood cells in our own immune systems. The Gulf hasn’t died, but it almost certainly has changed; the jury is still out on the short- and long-term environmental damage this spill has wrought. Independent scientists and those involved in the official Natural Resources Damage Assessment process suggest it may be years before the full account can be written. Likewise, the full impact of the spill on other culturally and economically important industries in the Gulf region and beyond, like seafood and hospitality, may take a few years to understand. So will the human health effects of the spill. 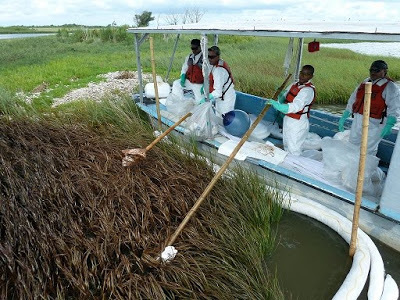 Cleanup workers wiping oil from marsh grass. U.S. Coast Guard Photo by Petty Officer 3rd Class Derek W. Richburg. As time goes by it’s looking less likely that the well-researched recommendations of the National Oil Spill Commission are going to be implemented, meaning offshore drilling will continue to be a high-risk activity. Why is this? I’ll turn it over now to a couple of writers who sum it up far more eloquently than I could. David Jenkins of Republicans for Environmental Protection blasts the inaction by Congress in the wake of this historic disaster in The Spill Washington Forgot. And Carl Cannon puts the politics and policy in context in this compelling analysis, Political Partisanship and Earth Day. Now for the good news: We’ve made real progress here at SkyTruth, forming a space-water- air SWAT team with SouthWings and Waterkeeper Alliance. The Gulf Monitoring Consortium leverages the skills and expertise of our organizations to help us efficiently and effectively evaluate, investigate and document oil pollution incidents in the Gulf of Mexico. We’ll keep you updated as the Consortium grows, builds new information tools, responds to future incidents, and publishes our findings. https://skytruth.org/wp-content/uploads/2011/04/deepwater_horizon_sinks_NYTimes_26dec10_1.jpg 267 400 John Amos /wp-content/uploads/2016/08/test_logo.png John Amos2011-04-22 18:16:002019-02-26 09:48:00BP / Deepwater Horizon Oil & Gas Disaster - What's Changed? Over the course of the past few months, SkyTruth has been in the news quite a bit. Just yesterday, SkyTruth was mentioned in the Huffington Post. And on April 15th, SkyTruth was mentioned in this Washington Post article written just before the anniversary of the BP Deepwater/Horizon tragedy. Check out our inclusion in the New York Times Green Blog, and an article written by Dr. Ian MacDonald in the December 2010 edition of Significance Magazine features a shout out to SkyTruth. The Alabama Press Register featured an interview with SkyTruth President, John Amos in February, and the San Antonio Express News included SkyTruth in this piece that they wrote on February 18. To see more of our work featured in various media outlets, you can visit our Media page on our SkyTruth website. Stay tuned, we’re looking forward to making a difference as the year goes on!